I was born in Toronto at the dawn of the swinging 70s….which possibly explains why I’m such a fan of the Big 80s. I spent my first 18 years living in Toronto, Canada, and then traveled to Franciscan University of Steubenville for the next four years for college. While there, I met my beautiful wife, Jeanna, and we were married after grad in 1992. We now have seven children, and live in Vancouver, WA. I love burgers and well-done fries with lots of white vingegar. My boys love The Tripods Attack. Why is it not an AR (Accelerated Reader) Book? Can you submit it to be an AR book? I have tried with no results. Looking forward to the sequel. The title sounds a little like Robert Hugh Benson’s The Lord of the World. Which is an excellent book in its own right. Regrettably, I’ve no idea how to submit Tripods as an AR book…which is a bit surprising considering how long I’ve been a teacher. I would guess speaking to the head of your school’s English department would be a step in the right direction. I’m looking forward to the sequel’s publication, too! Please pray for it and my publisher. Sorry it took me so long to approve your comment, BTW! It never showed up in my email hopper until now, for some reason. Ah, well! I am glad you brought up Gilbert being a ‘Yank,’ since even those GKC fans who like The Tripods Attack take issue with my choice here. 3) The far majority of my readership was much more likely to be American, and more able to connect with a character like themselves in some ways. Yes, I have since read the League of Extraordinary Gentlemen. In actuality, the Sorn are from CS Lewis’ Out of the Silent Planet, and the mollusks are from HG Wells’ War of the Worlds. Both I and Alan Moore appropriated them (and many other characters and elements!) as homages to an unfairly-neglected period in popular literary history. God bless, and thanks for the kind commentary! It makes all the spam worthwhile. I read your book and I thought it was awesome. The only thing that rubbed me the wrong way was Chesterton being a yank. I loved the steam-punk atmosphere. I am was less familiar with Dr Who, but your book has kindled an interest in him. I love the Father Brown stories (especially The Invisible Man and The Hammer of God) and the Man Who Was Thursday is my favorite book. The only thing about Chesterton (the real one) is that he is quite an enigma and is thus hard to describe to other people. The description of the conflicts on Mars between the Mollusks and the Sorns (and all the other aliens) reminds me of the League of Extraordinary Gentlemen. Wonder if you have read such a series. Thanks again for writing the book and keep writing more in the series. Haven’t talked to you in ages. I helped you with this site several years ago. I just noticed your domain is up for renewal. Since I can’t find a better place to ask, I’m currently reading The Tripods Attack and enjoying it. I just read the passage where the Doctor explains that he works for the Special Branch. In it you mention that “Vice President Andrew Jackson was elevated to presidential office as soon as Lincoln died” (p.150). Since Andrew Johnson was Lincoln’s VP I’m wondering if that is a typo or if you mean for Jackson to be the VP. It probably doesn’t make much difference to the story and since it is set in an alternate universe I can see it go either way. However this history geek is extremely curious. Thanks! The Constitution states that, if the President dies while in office, then the Vice-President automatically becomes the president of the USA. While Lincoln’s VP in our world was initially Hannibal Hamlin, for his 2nd term, he chose…Oh…. Yeah, it’s a typo. I won’t try to hide. God bless, and thank you for the lesson in humility. 1: The Titanic left from England and sank in the Atlantic Ocean on its way to America on its first (and last) journey. In your book why did the Titanic leave from America and go to Newfoundland instead of leaving from England and going to America? 2: Why did John Wilkes Booth decide to do something for the Secret Branch? 3: What is your estimated date for the release of the Emperor of North America? 1) Yes, you are correct re. the Titanic. In the world I created, I wanted many of the historical facts we take for granted to have been turned about as a result of the first computer by Babbage being completed a century earlier than expected (note the conversation Gil has with Effortson for clues on this…). Hence, the Titanic’s journey, Gilbert being raised in America rather than Britain, the Americas being split into 5 separate countries, and so on. 2)My goal was to have Booth be a dupe for the aims of the Special Branch, believing he was engaged in a kind of holy cause, while actually serving the aims of men with much more sinister purposes in mind. 3) Right now, the date for the publication of the sequel is out of my hands, as I submitted it last October. Please pray for it and for my publisher, and I’ll keep folks posted as things develop! I can’t tell you HOW MUCH I loved the first book. It was exciting, action-packed, and everything I didn’t expect it to be- but one thing that I loved was the fact that there were many intellectual debates (based on Chesterton’s own words) sprinkled throughout the book. I have to say that this is one of the most unique books I’ve ever read- and believe me, I’ve read quite a bit in my time. One of my friends read the book before I did, so when I saw him after finishing it, I loudly exclaimed “MY BROTHER’S NAME IS ARCHIBALD!” Needless to say, he had to take a few moments to realize what exactly I was quoting. After that, he subsequently fell into peals of laughter and began to tell me how much he loved the book. When I read the next one I shall another review. I think that your book well deserves more of a spotlight than it’s been received, so that’s my little contribution to the ’cause’. Wow, Marlene! Thank you for that glowing report! I hoe you enjoy the second one as much. As I’ve mentioned earlier in the blog, the Second book in the series is titled The Emperor of North America, and you can find it at its publisher,Bezalel Books, by clicking here. Yes, I’ve had a wonderful time writing the series. I hope to finish the third and final volume this summer (’12). Titled Where the Red Sands Fly, it follows the adventures of Gilbert, Herb, Frances and several other intrepid adventurers like a youthful Hilaire Belloc on the Martian colony of Syrtis Major. Thanks for offering to write another review for Emperor as well! If you could put the reviews for Tripods and Emperor on Amazon.com as well, I’d be quite grateful, as I’m told that helps the sales. And, if you have younger siblings, I have another book coming out this summer (God Willing) from Hillside Education publishers. Ttitled The King’s Gambit, it’s written for the 9-12 year old audience, and takes place in our world, unrelated to the Gilbert universe. May God bless your summer, and thank you again for the kind words. I have been having some trouble writing the 3rd Gilbert book for a few reasons (most of them time related), and a piece like yours helps keep me focused. Hi, John. I did some volunteer reading for CWG for the SOA, and one of my assigned books was _The King’s Gambit_. Are you that John McNichol? I wanted to check before I gushed enthusiastically about it all on your page. If not, though, I’m glad I found *this* page so that I can check out the Young Chesterton books! Yes, it’s mine! Feel free to gush away! By the way, I know the Catholic Writer’s Guild, but what is the SOA? I am now at work on editing the 3rd book in the YCC, “Where the Red Sands Fly”. Oops! Sorry for the long response! Yep, I am indeed THAT John McNichol. Both the YCC and The King’s Gambit were by me, and I’m glad you enjoyed them! John! So nice to stumble upon you and Dina Marie this morning. I guessed it was you, solely by the sound of your voice and the topic. I did not know you had authored any books, though, so was honored to have won one by calling in. My daughter, age 9, and I will read it together, whichever it is. Good for you! See you at Mass! Hi Terry! Thanks for listening! , which is the first book in the Young Chesterton Chronicles series. either on my Amazon.com page, or at my publishers at Sophia Institute Press. I just wanted to thank you for your awesome Chesterton fiction; my brothers and I have thoroughly enjoyed reading them, quote from them (I particularly like G.K. C’s at the beg. of each chapter) and are eagerly anticipating when we can read on. And you got me reading the real Chesterton, for which I am very grateful. Who knew there was a writer whose style could be so jovial, witty and serious simultaneously? Thanks! Wow! Thank you. This summer was a very difficult one for my family for a variety of reasons, and I didn’t get nearly as far into editing the third Chesterton book as I wanted to. Kind words like yours give me the *omph! * to move on and keep on editing. WoW! THank you! I am back in the saddle, trying to both edit the third YCC book and work on the graphic novel I’ve been contracted to put out, but we’ll see! Say a prayer to St. Francis De Sales for me! Hi, Mr. McNichol! I heard about your books from my brother (Terry T. whose email is above) and bought them as fast as I could, being a Chesterton fan and a life-long fantasy lover–well, at least since age seven when I first read The Lion, the Witch etc. I just finished The Tripods Attack! and am now sweating with Gilbert in his fancy clothes as he looks for Frances in the ballroom. I can’t wait to pass Tripods on to my twelve-year-old son . . . he’s the only boy, with four sisters, and the reams of fiction in this house tend to the girl-centric. I’m so pleased to find some good manly fiction that glorifies God. (Of course the girls will read it too!) Keep up the good work, sir! When does #3 come out? Hi! I wish I could give you a definite answer. I’m trying to edit the 2nd draft of the 3rd book, while also working on another graphic novel I’vebeen commissioned to do. Say a prayer to St. Francis De Sales for me! I really wanna start pounding this last one outta the park. Please pray for my family, esp. my kids. When things are smooth there, the writing goes way easier. PS: Thank you for the ‘good, manly fiction’ line! Glad to see when someone gets it. I was doing some research on Catholic Writers Guild and found you were a recipient of their 2013 CWG Seal of Approval Title. Congratulations! I went to your blog to learn how you became a children’s author. Yes, I’m a student with the Institute of Children’s Literature right now. Maintaining a Catholic prospective in our creative work is really important and hopefully more pleasing to God. Being a registered nurse I noticed you and your family are having personal health challenges at this time. I’d like to share some hopeful resources with you in case you haven’t seen them yet. Due to my own health concerns I had to research other avenues of wellness and both my husband and I have benefitted greatly from life style changes. If you already know about Dr. Terry Wahls just ignore my meddling and be assured I will keep you, your wife and family in my prayers. I have passed your links onto my friends. While I am obviously not qualified to either endorse or dispute information in this area, I am always happy to share something that has a shot at helping those I care about. I just wanted to say I love making youtube videos and just any sort of movie! someday when I’m older and have enough money and equipment it would be really cool to make a movie out of your books!! Thank you, Patrick! I’d love to see that happen, too! A good fellow from Kolbe Film Academy put together a film script based on The Tripods Attack a few years let. Let me know if you could use it- I’m sure he wouldn’t mind. Hey John, I’m a big fan of the young Chesterton chronicles and I was wondering if you could give us an update on how the third book’s coming. Also I was wondering if you could also tell is who the Doctor is. My sister thought he was Dictor Who (she’s kind of a nerd) but he’s obviously not. Thank you and God bless. Glad to hear you like the series! short version: We’ve had a couple of big family issues the past 2 years, including my wife having a stroke. As for Doctor Who…no connection intended. Though I am a Tom Baker fan, myself. Hey John, I actually just read that part again a few seconds before reading your reply. I don’t know if you want to keep it a secret or not so I’ll just say, is he one of the main characters from an awesome detective series by Sir Arthur Conan Doyle? I reference that again in Red Sands. But you got it. 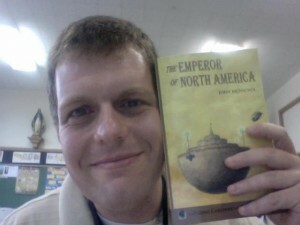 I’ve recently read both The Tripods Attack and The Emperor of North America, and greatly enjoyed them. I’m greatly looking forward to the third book, if you could say where it would be coming out and when. Thank you, Chris! Say a little prayer for the third volume, as it continues its long journey towards the printer’s press. You’ll find out who the Redhead is if you watch the scene where she ‘helps’ Gil escape the floating city. Women usually get it before men. In much of Chesterton’s fiction, a redheaded girl makes an appearance either briefly or for a significant amount of time. Chestertonians often speculated who she might be, and the prevailing idea is that she was the sister of one of his debating teammates. For me, I thought it’d make for an enjoyable character who flits through Gilbert’s life as the redhead flits through the fiction of the real-life GKC. I loved your previous two books and have my friends and brothers hooked on them! Is there an update on the status of your third book? I’d really love to know when it’s coming out!! I have a publisher for the third book, and they are securing the rights to re-publish The Tripods Attack as well. What I’ve told a few dedicated, patient fan such as yourself is this: If you promise to read it through and give feedback (what works & what doesn’t, etc., ) , I could email you the current draft so you can see what happens next. Hey there, John. I was first introduced to your GKC novel by a cousin who is an avid reader. As a Catholic family, we hold Chesterton in pretty high honor. I’m also a huge sci-fi geek. Anyway, I run a blog. I have interviewed authors before, and I was wondering: would you be open to being interviewed? thanks for your time. Hello, John. Sorry for the long response…yikes! Back in Feb! Sure, I’d love to do an interview with you. I have PM’d you with my personal email using the one you left here, and look forward to hearing from you! I have read several times (and enjoyed quite a lot) both of your Gilbert books. I love the large number of intertwined elements and characters from Chesterton, Wells, Lewis, Twain, etc. Are there any plans to have Red Sands finally published anytime soon? P.S. I’m a tenth grader, and I also live in the north Texas area. P.P.S. Why are Anne’s eyes so emphatically described as “china blue”? If she is who you strongly imply she is in Emperor, shouldn’t her eyes be grey?